"As a psychologist, I have greatly appreciated working with children and adults. There is such a great joy in acting as a facilitator for change and growth, especially in young people." 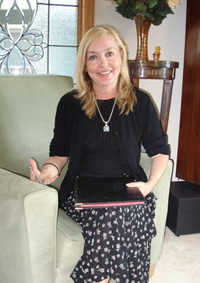 Suzanne Simpson, PHD is a licensed psychologist and a clinical director of child studies at West Coast Psychological Institute. She received her master from Denver University, another master and PHD from a California School of Professional Psychology. Since graduation, she has been actively involved with children, adolescents, and adults for a combined twenty years of experience. Suzanne Simpson is also the original creator of Esteem Dreams which creates children's CD's using classical music and actors to anchor complex developmental milestones in children. "The most important role I have as a psychologist is to create a bond of trust so that growth and healing can occur. Each person is different. Each person is unique. Each person deserves to be his or her best. It is common knowledge that children and adults thrive in a nurtured and safe environment. That is what West Coast Psychological Institute is all about. We provide a safe and comfortable place for our client/patients to heal and to grow. I invite you to visit West Coast Psychological Institute to experience a positive and affirming opportunity for change in your life experience."